The AC Filter is a traditional automatic backwashing system developed for coarse and fine water filtration. 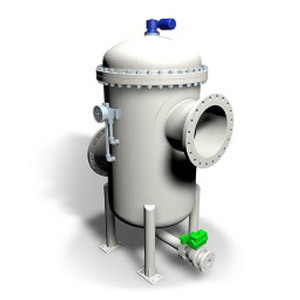 It is especially designed to handle the nature and volume of solids in seawater, mainly used for oilfield injection or in demanding duties like the pre-treatment of water and waste water filtration. Thanks to its features, reliability and Filtrex experience, the AC filter is also adopted in the offshore installations as the North Sea. AC can be tailor-made using any exotic material and following the most severe regulations worldwide. Large filtration area using a filtration media consisting of candle bundles assembled in a tube plate. This gives a higher specific flux rate in a compact and lightweight unit. Wedge wire filter surface provided in a rugged construction gives high mechanical strength. A rotating backwash mechanism, using low friction material nozzles, simplifies the design where metal to metal surface contacts are common. In addition the backwash nozzles are designed to be self-loaded when in pressure, ensuring minimal wear of the contacting surface as a result of heavy suspended sand sediment content in water. This unique feature reduces any kind of drag strain of the backwash arms, which in turn reduces the load to backwash motor and gearbox, ensuring integrity of the internals that can be easily inspected through the hand/man hole. Maintenance is minimal in over 20 years of continual use. However, should dismantling be necessary, it is a quick and simple operation. The top cover can be easily opened to remove each single candle or the whole bundle assembly, according to the best plant maintenance procedure. No special tools are required in either case.